In Azure, we understand that the breadth and scale of the cloud demands an ever-evolving commitment to continuously improve the customer experience and help our customers achieve more. Content Delivery Networks (CDNs) enable cloud-hosted applications to scale and deliver content quickly and reliably across the globe. Azure CDN is built from the ground up to deliver best in class CDN services through both our ecosystem of partners as well as our flexible cloud platform. Today we are excited to announce the public preview of Microsoft as a provider within Azure CDN, enabling Azure customers to use and deliver content from Microsoft’s own global CDN network. This CDN option is being added alongside existing provider options from Verizon and Akamai. Microsoft has gone through its own cloud transformation with Office 365, Skype, Bing, OneDrive, Windows, and Xbox with a distinctively hybrid consumer and enterprise focus that has developed and shaped our unique perspective on networking and CDN over the last 5 years. Running at the Edge of Microsoft's Global Network, this new native addition provides Azure customers access to a highly seasoned CDN platform. 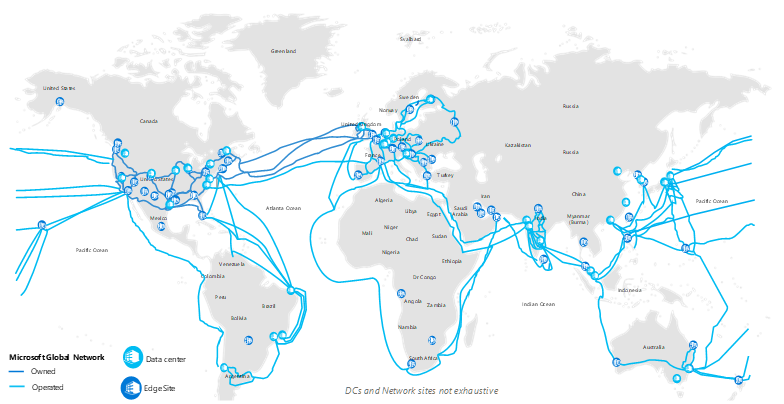 Connectivity within Microsoft’s network along with new Regional Caching capabilities enables more consistent, more predictable cache fill performance by providing multi-tier caching along direct, private access to content in Azure from each CDN edge point of presence (POP). Azure CDN from Microsoft provides access to 54 global Edge POPs in 33 countries and 16 Regional Cache POPs at strategic network hubs across our fast and reliable anycast network. This puts your content 50ms on average from users in more than 60 countries worldwide. In addition to launching access to our native global network, we're also launching a public preview of use-your-own SSL certificate, enabling customers to customize and self-maintain their own certificate and create a CDN solution perfectly fitted to their needs. With our strong commitment to customer value, providing content delivery and acceleration for cloud scenarios on a scale that few individual organizations can provide, Azure CDN from Verizon, Akamai, and now Microsoft will unlock opportunities for all our customers to achieve more with Azure. Get started with the Azure CDN from Microsoft today! If you are interested in exploring capabilities beyond the standard offerings, please contact us at cdnteam@microsoft.com.